Cece Bell lost her hearing from a bout of meningitis when she was four years old. 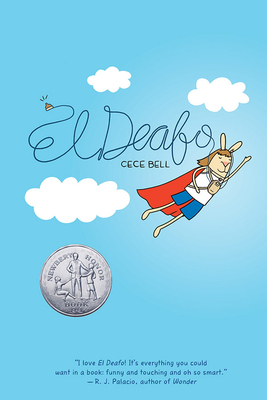 In this memoir, told and illustrated as a graphic novel, Cece relates how her family tried to help hercope with this loss. She attempts to learn lip reading until she is outfitted with a Phonic Ear in the first grade. The best thing about wearing the Phonic Ear is that it equips her with secret super powers becausesuddenly, she can hear her teacher not just when she’s in the classroom, but in the teacher’s lounge, the hallway, and even the bathroom. When Cece’s family moves and she has to start a new school, her loneliness and need for friendships are complicated the self-consciousness she feels wearing her clunky Phonic Ear. Will the superpowers it brings help her with what she wants more than anything else, a true friend?